LTMqoViewer is a tool for displaying 3D model created with the metasequoia and STL format. At LTMqoViewer, two can be displayed in the mode. 1) Walk view mode which moves freely in the inside of 3D model. 2) Model view mode seen from the surroundings focusing on a model. Operativity was thought as important and it adheres to intelligible operation intuitively. It can check by iPad. 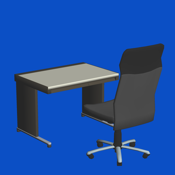 Please take a walk with game feeling with the sample model reproducing an office. There are six keys which attached the keyword into the sample. It will become a problem if it arranges in search of all the keys. The answer? .... on a support page.